Loves Me Flowers is a full-service floral design company that provides floral and plant arrangements for events and for everyday deliveries and celebrations. 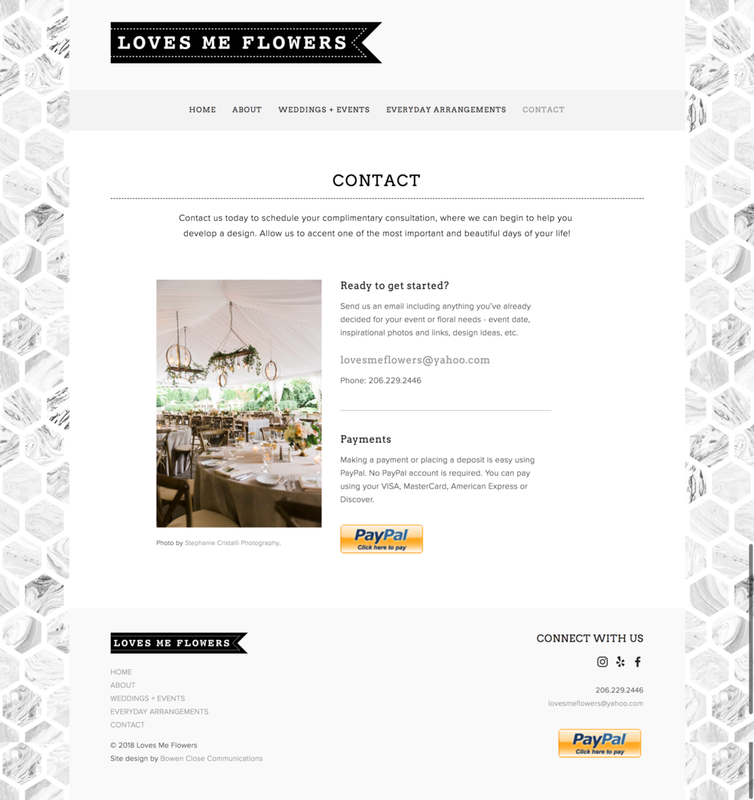 Owner Kendra wanted a simple but attractive new site that would showcase her event work and allow customers to order arrangements for delivery right from her site. I helped Kendra design and organize her site content and put together an ordering system that meets her needs and is easy for customers to use. Sugar & Spice is a wedding and event logistics, coordination, and design company that needed an expanded website to more fully describe their services, show images of their work, and communicate a style and brand in line with the founder’s vision. I helped Mikaela of Sugar & Spice plan her new website’s structure, content, and design based on her goals for her business and how she wanted to visually communicate her style - glamorous and classic with bright splashes of gold and pink. I completed a significant amount of custom coding and custom graphics on her Squarespace template, including the gold splash graphics and the various modules on the site. 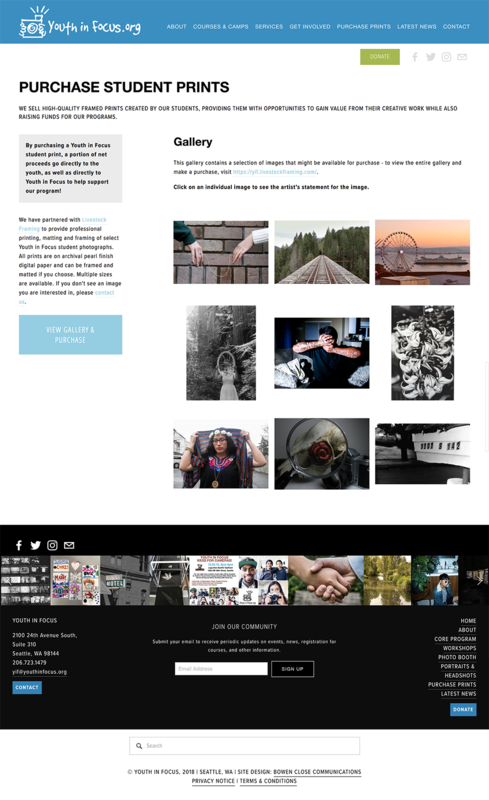 Youth in Focus is a non-profit organization that needed a new, clarified website to house information about the organization, registration for their many programs and services, and portals for the third-party services they use for purchasing prints and accepting donations. I worked with Youth in Focus to clarify their goals and necessary functions for the site (including course applications and registrations). We also discussed how the organization might grow in the future in order to make sure the site will continue to work for them. 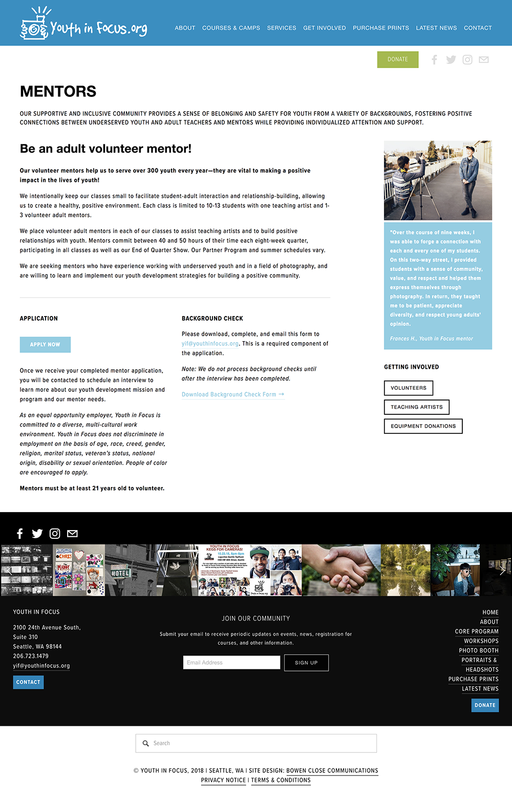 I assisted the Youth in Focus team by proposing a new structure to the site that made better sense for users and included key elements that visitors would look for when visiting the site (e.g. an About page). 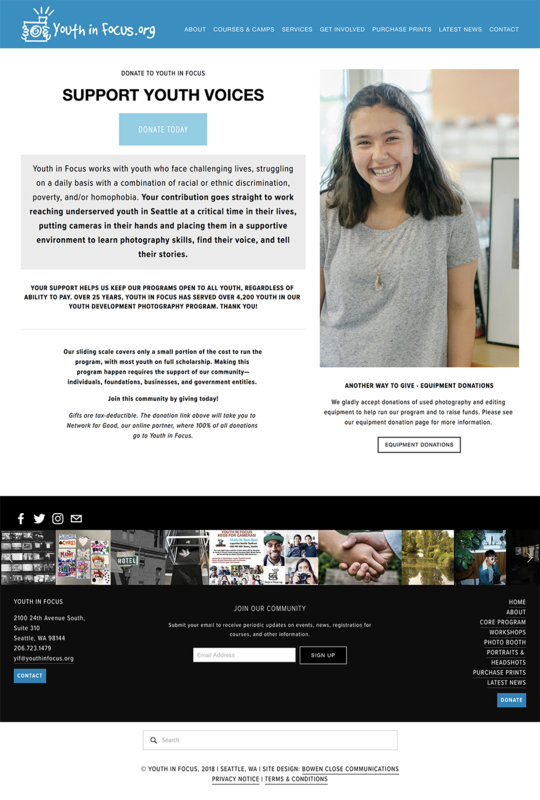 I also worked with Youth in Focus on a variety of design, strategy, and copywriting projects including fundraising materials, email newsletters, a communications calendar, and their 25th Anniversary campaign. Triangle Resiliency Collaborative is a new non-profit organization that needed a website to house information about the organization, registration for their events, and a small clearinghouse of research, information, and resources for resiliency and the Community Resiliency Model®. After designing their logo (see logo gallery here), I worked with the TRC board to determine their goals for the site and necessary functions (including an event calendar and a Speakers Bureau search function - still upcoming). We also discussed how the organization might grow in the future in order to make sure the site will continue to work for them. I guided the TRC team through a process to organize the site content into sections and pages that made the most sense for all site visitors, whether new to the topic area or well-versed in the subject. Subsequent to the first phase of our web project, I helped TRC develop event registration and purchase capabilities for their site, utilizing Squarespace's commerce options to create a system that met their needs. This site features custom icons, a scrolling index homepage, and custom-coded main page header, along with an event calendar and event registration/payment capacities, resources pages, and contact page. Additional content is coming soon, including a searchable speakers bureau function. NOTE: TRC has since changed their name to “The Resiliency Collaborative.” I also handled updating their logo, website, and all technical backend changes to accomplish their name change (e.g., URL, email server, etc.). Tahmina Ringer of Amaranth Floral and Event Design had a bare-bones website she had put together on her own, but she needed someone to help make the site technically functional and to better showcase her gorgeous floral and event designs. Together we worked through her priorities for the site, what information it should include, how it would function, and how to bring her beautiful work to the forefront. We discussed where her business might grow in the coming years in order to make sure the site was flexible enough to grow along with her. 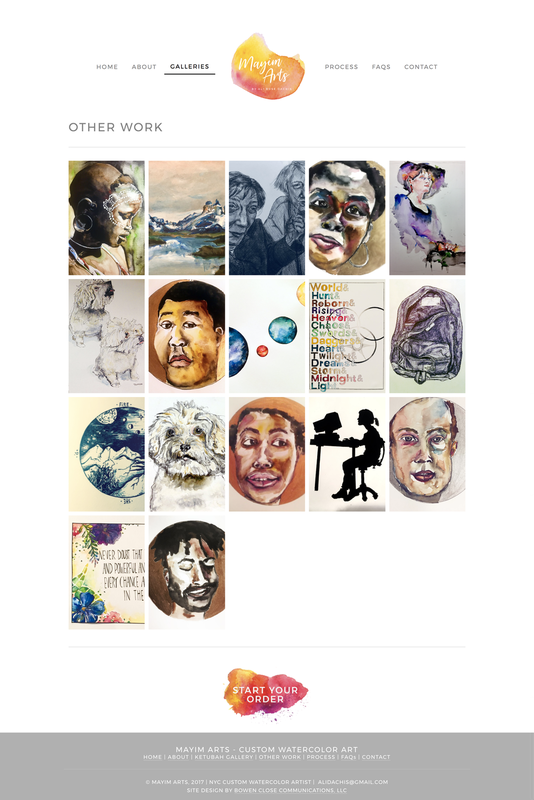 Along with a custom homepage, about page, testimonials page, and contact page, this site features a series of galleries, profile pages for each gallery with photos and text, and a custom questionnaire. Ali Dachis of Mayim Arts needed a site to showcase her art and provide functional information for people interested in custom Ketubot and other commissions. She also needed a logo to use for marketing and wanted to integrate her work into her site and branding as much as possible. I worked with Ali to develop a logo and otherwise integrate her watercolor "splashes" into the design for the site. The most exciting element was her interest in integrating a time-lapse video of her creating custom art, which is featured predominantly on the homepage (when viewed on a desktop computer - mobile screens do not support homepage videos). This site features extensive custom coding to manage the relationships between the logo, the video/image banners, and other design features. 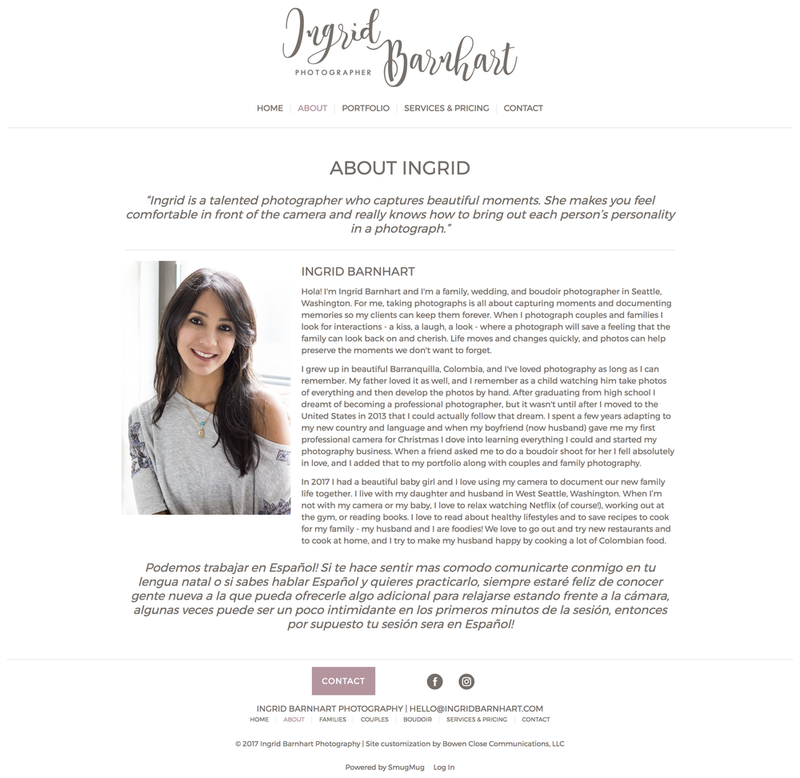 Ingrid Barnhart needed a site for her family, wedding, and boudoir photography business - both to showcase her past work and provide functional information for potential clients. She was committed to working with SmugMug, which provides limited design capacity for websites, but I did extensive custom coding to develop a particular design aesthetic and make it consistent throughout the site. Bowen Appétit was an award-winning food blog and a business offering hands-on cooking classes for both public groups and private parties. The website featured a heavily customized template and pages for class registration, recipes, tutorials, special features, and more.